» Briggs Woods Halloween Event & Fundraiser "Wildlife Safari Hike & Haunted Woods Hikes"
Camping: We have 79 sites available for camping at Briggs Woods. From tent camping to accommodations for the large RV units. There are 30 full hook sites with water, sewer and electricity. Full hook up electrical sites are equipped with 50 amp, 30 amp and 20 amp breakers. All other sites are electrical and have 30 and 20 amp breakers with GFI outlets. A modern shower house with handicap accessibility is available. There are two odorless pit latrines available in the off season. WIFI is available within Briggs Woods Park. 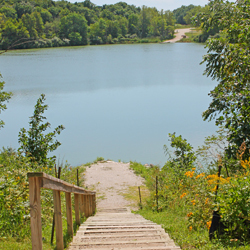 The 70 acre lake offers swimming with a sand beach, fishing, and boating with electric motor only. There are six sites available for reservation PLUS a group circle area of six sites. You may hold a site with vehicle, tent, or camper and pay for the site each night. Sites allow up to 6 people per unit. We do not allow to double up sites. An extra tent can be erected on the same site as another camping unit as long as the occupants are children and under the age of 16. Please contact us if you have any further questions. Enjoy your camping experience. Dumpsters will be available from May 15 to September 15 at the campgrounds only. Before and after these dates, the carry-in carry-out policy will be enforced. Thank you to Goodlife RV for sponsoring trash service! CABINS AND SHELTERS - For reservations open the Facilities tab - Cabins are available all year long. Trails: There are numerous walking and hiking trails throughout the rugged timber and prairie remnants in the park. We also have a 10 foot wide concrete multi-recreational trail designed for easy access. This trail winds through some timber areas and follows most of the lake on one side and continues all the way into Webster City making the paved trail just 5.7 miles. We have 10 canoes and 4 kayaks available for rent. We do not provide shuttle service, but will take them to the lake. We are located at 2490 Briggs Woods Trail in Hamilton County, Iowa, two and one-half miles south of Webster City off of Highway 17. The park is 550 acres and is ideally located, with convenient access to all parts of Hamilton County as well as adjacent counties. Highway 20 offers clear access to the east and west, while Interstate 35 is located about 12 miles east of highway 17. The Johnson Addition to Briggs Woods Park, located 1.5 miles southeast of Webster City on 238th Street, is 60 acres of riparian woodland, reconstructed prairie and remnant bur oak savanna. The 17 acre reconstructed prairie serves as a production site for local ecotype seed that is used on other Natural Resource Areas. Magnificent open-grown bur oak trees intermingled with prairie grasses and wildflowers can be found on the savanna. Nature observers will experience a wide diversity of habitat types in close proximity. Refuge - no hunting allowed.